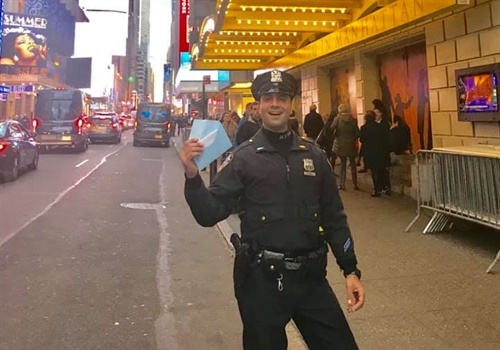 NYPD Officer Helps Irish Family See Broadway Musical "Hamilton"
The department said in a Facebook post, "When a first time visitor to NYC found out she was $20 short for tickets after standing in line for 4 days, she ran for help— and luckily met Officer Dicandia. He understood the magnitude of the emergency and pulled a 20 out of his pocket so she didn’t have to throw away her shot." Image courtesy of NYPD / Facebook. An officer with the NYPD happened to be nearby and ready to render assistance when a woman visiting from Ireland discovered that—after waiting in line for four days—she was $20 short. The department said in a Facebook post, "When a first time visitor to NYC found out she was $20 short for tickets after standing in line for 4 days, she ran for help—and luckily met Officer Dicandia. He understood the magnitude of the emergency and pulled a 20 out of his pocket so she didn’t have to throw away her shot." The department said that a few weeks later, a kind thank you note arrived at the Mayor's Office saying, “We were totally overjoyed and beyond grateful when he opened his wallet and just handed us $20. My eldest daughter was crying when she was speaking to him. It was without doubt the best night that would not have been possible without Officer DiCandia's generosity and kindness."